OTTAWA -- Canada is raising concerns over reports that Rohingya refugees will soon return to Myanmar -- the country in which they have been targets of what has been officially declared a genocide. Foreign Affairs Minister Chrystia Freeland and International Development Minister Marie-Claude Bibeau say they are "deeply concerned" about a proposed repatriation of Rohingya refugees to Myanmar this month. 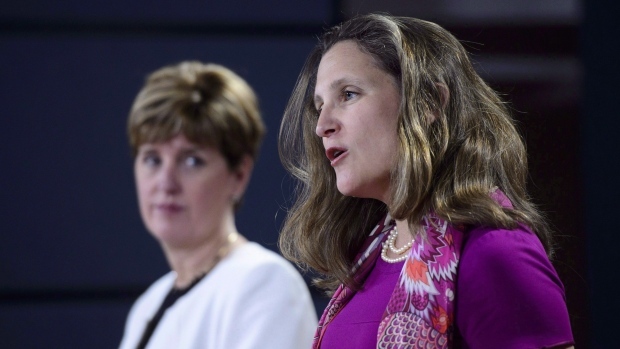 Freeland and Bibeau say repatriation must not be rushed and they're urging Myanmar's government to ensure refugees that do return are protected and their human rights are upheld. In September, Parliament voted unanimously to strip Myanmar's de facto leader Aung San Suu Kyi of her honorary Canadian citizenship for failing to stop the atrocities committed against the Rohingya people.